Technology and rapid digital interface is the greatest highlight of these banks that base their growth on market funding and technology adoption. This drives them to get more customer centric and aggressive in the marketplace. However, is it enough? What can this breed of banks do to get more customer centric and effectively leverage the digital powers? The number of Challenger banks have now grown to over 100, from South America to continental Europe, to Asia. For instance, Brazil has Banco Original and Nubank, Germany has SolarisBank and N26, and amongst the Asian players are China’s MyBank, WeBank, Digibank of India, Timo in Vietnam, Jibun Bank in Japan, and South Korea’s K Bank and Kakao Bank. Most of these banks are backed by huge names and conglomerates, hence, the pressure to perform is intense! Considering these banks do not offer a full suite of banking services, they are not under the burden of the legacy systems and heavy regulatory requirements. Consequently, the opportunities are more welcoming, as these banks can focus on niche products than the conventional ones, and get more creative in their offerings. At the same time, there is a pressure to offer a user-friendly interface and attract the right audience, and retain them effectively. Challenger or Neobanks are bound to face hiccups on various grounds, namely, Technology driven challenges, consumer driven challenges, and market driven challenges. Hence, it is important that every service platform, consumer-digital interface, and application is tested for flaws and assurance of service. Technology is the biggest resort, but ensuring that it works for you is equally business critical. How can Digital Assurance and Testing bring value for Challenger Banks? It is very much evident that Challenger banks are constantly under the pressure to stay successful and sustain in the ever-volatile marketplace. Customer centricity is at the core of every step and action that the bank takes to stay relevant and compelling for their target group. Digital Technologies make this possible and have been the biggest enabler to help build the expected solutions and ensure customer retention. Nevertheless, it involves numerous risks and challenges that can come up with adoption of digital technologies and building solutions around it. Digital Assurance and Testing with its intrinsic capabilities can help challenger/neobanks to overcome these challenges and sustain themselves despite market dynamics and uncertainties. Let’s check out how Digital Assurance and Testing can help strengthen the customer-centric approach for this new breed of banks. The only way to make your business work is to keep enhancing consumer experience. In the case of banks, it is important to build robust digital platforms and make your applications simple, but interactive. Customers demand uniform experience across different devices and platforms, and even across various configurations. Digital Assurance helps you to ensure consistent experience across various platforms and ensure the desired customer experience. Many of these midsized and funded banks have global expansion plans. They have fresh ideas and services to share, but what they need to ensure is customer experience. 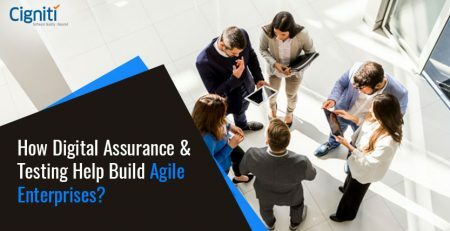 Digital Assurance and Testing, powered by automation has capabilities to eliminate bugs and handle issues way ahead in the development cycle. This will not only deliver a market-ready application, but also make the consumer come back and experience more. Mobility solutions have transformed the way businesses build and market their solutions. Banks have been able to extend mobility services to their customers and offer much more across the mobile platform. There will be a growing need to ensure that applications are device friendly and perform flawlessly across any given device or operating system. For instance, today every challenger bank is known for offering iOS and Android applications that have been designed creatively to stay compatible across any device. How often do you receive messages from your bank to try out a new feature, or a new service, or a new investment plan with them? Must be a daily affair. The banking sector needs to stay innovative to ensure that investments keep coming and the funds keep moving. Launching applications and upgrading them in real-time is very much essential for the banking sector. Innovation has to be made foolproof with Digital Assurance and Testing efforts. It will help banks to ensure performance and functional excellence throughout the customer lifecycle. Moreover, nothing is as crucial as ensuring security of the application across the digital platform that is infested with bugs, malware, viruses, and much more. Innovation with assurance is needed to make the solution foolproof and appealing. Hence, leveraging a robust Security Testing strategy becomes imperative in your Digital QA plan. Banking involves miniscule activities that are crucial for the users, which could be as simple as updating the accounts. A Digital interface makes this easy, rapid, and responsive. Cigniti’s Digital Assurance and Testing methodologies, techniques, and specialists ensure that the apps are thoroughly validated for User Experience (UX) and cover responsive web design patterns, screen resolutions, accessibility, usability, content, navigation, etc. Connect with our Digital QA team to build a relevant Digital strategy for your business needs. 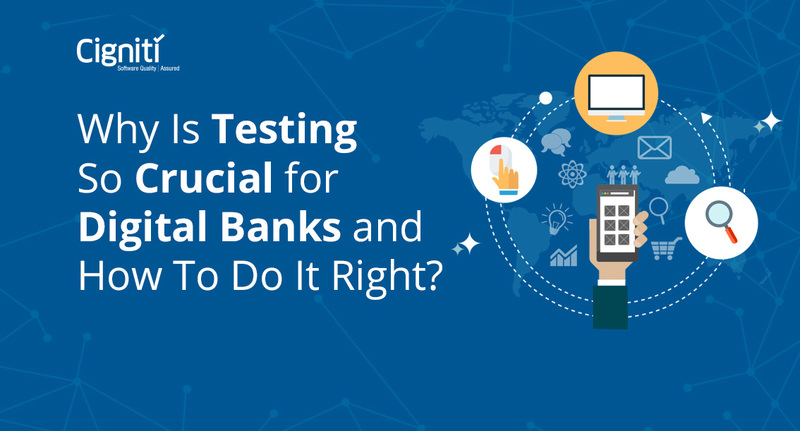 Why Is Testing So Crucial for Digital Banks and How To Do It Right? 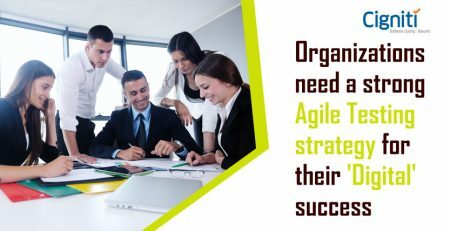 How Digital Assurance & Testing Help Build Agile Enterprises?